Congratulations to "Colleen C.", the winner in Susanne's giveaway. Thank you to all who participated! Good day. It’s always a pleasure to spend time with you here. Please comment at the end of the post with your name and contact information for your chance to win an electronic copy of Secrets and Lies, my romance suspense that is part of a multi-author collection entitled, HEARTS OF BRADEN. When I got married 45 years ago, my identity changed. I had been Susanne, Leo and Cecile’s oldest daughter, but now I was also John’s wife. After I had children that label changed again. I was Greg’s Mom, Jason’s Mom, Angela’s Mom, but I was still Susanne, Leo and Cecile’s oldest daughter, and John’s wife. Later, when the kids were all in school, I returned to the workforce, and I became Mrs. Matthews, Mrs. M., Madame, if the students were in French, teacher, Mrs.—but I was also still, Greg’s Mom, Jason’s Mom, Angela’s Mom, Susanne, Leo and Cecile’s oldest daughter, and John’s wife. Get the picture? It’s possible to be more than one thing without it having to change anything else about you. Today, I’ve added Susanne Matthews, author, to my list of who am I’s. While some books are written and fit neatly into one genre, others do not—especially books that I write. Is that a good thing? Is it a bad thing? I don’t know. To be fair, all of my books fall into the category labelled fiction. From there, they fall under the label romance, but after that, they can go almost anywhere. 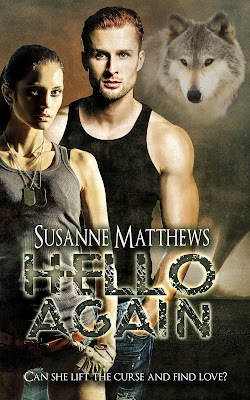 A perfect example of that is my latest release, Hello Again. It won’t take much to realize this is a reunion romance, the title gives that away, but it’s far more than that. What more is it? Well, let’s break it down. Hello Again is a contemporary romance. The story is set in modern day, during the summer, in Saskatchewan. That also makes it a Canadian novel, primarily set on the Carry the Kettle reserve, just east of the provincial capital of the province. That now makes it a Native American novel, what we in Canada call First Nations, because of its location and the characters involved. The story is based on a Lakota/Dakota/Nakota/Sioux myth about a chief’s daughter and the chief of the wolves, which deals with a shapeshifting wolf/man and a cruel medicine man who uses black magic to get revenge. That little tidbit now makes the book a paranormal romance. And the fact that one of the primary characters is a shaman who speaks to spirits and the other is the reincarnation of the chief of the wolves, the story is firmly entrenched there. But that isn’t all. Far from it! My heroine loses her husband and has to make it on her own. After a series of strange dreams she sets off for Saskatchewan and is almost killed in a tornado—so now we have man against nature, making it a survival novel. To top it all off, she’s rescued by a Royal Canadian Mounted Police officer who’s on the reserve trying to catch a motorcycle gang wreaking havoc by not only terrorizing the residents, but looking for sources to sell their drugs—the same motorcycle gang responsible for murders and his own attempted murder last summer, which makes it man against man, and that makes it a suspense novel as well. One book, many different labels. For Charley Winters love means loss and pain. She’s spent the last five years struggling with her grief. Existing, not living. Drawn to Saskatchewan, she travels west take the job she’s always wanted. But life gets complicated when she's rescued from a vicious tornado by her dead husband’s double, a man who makes her feel things she hasn’t in years. Add to that a native myth, a shaman, a green-eyed wolf, and her husband’s ghost ... Can she lift a millennia old curse and find joy and love again? There you have it, a novel that’s suspense, romance, and so much more. Thanks for dropping by. Don’t forget to comment for your chance to win. Happy Reading! 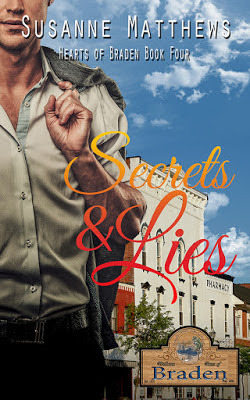 Please comment at the end of the post with your name and contact information for your chance to win an electronic copy of Secrets and Lies, my romance suspense that is part of a multi-author collection entitled, Hearts of Braden. Giveaway ends 11:59pm EST June 22nd. Please supply your email in the post. You may use spaces or full text for security. (ex. jsmith at gmail dot com) If you do not wish to supply your email, or have trouble posting, please email maureen@justromanticsuspense.com with a subject title of JRS GIVEAWAY to be entered in the current giveaway. Thanks so much for having me here again. I love spending time with your followers. No matter the label, I am always ready for a romance! Thank you so much for sharing with us today! You are a new to me author, which I love finding! Your book sounds awesome, I would love to read it. I also love reading books set in Canada, I've always wanted to visit there. I always enjoy a good romantic suspense and this sounds like a good one! Thanks for the chance! We can be many things to many people. I love all the romance genres floating around in your book! Thank you you for being here. I loved it when the heroine was tough as the description implied. Would love to read this book.